With career spanning over 30 years, Jezza is affectionately known around the world as'The Optical Bully' he messes with the mind in ways you would never believe. As an Adult Comedy Magician his show is perfect for parties, corporate events, Pubs, Clubs, Weddings etc. Whatever your need for hiring a Magician, Jezza can tailor his show to suit your audience; from Close Up Magic, to Adult Comedy Magic to Hypnosis he is guaranteed to hold everyone in a state of suspense and left with more questions than answers! Even after thousands of performances Jezza still gets a kick from gob smacked faces, the sound of audiences clapping and the cheers or laughter or astonished silence as an illusion draws to an end! Thank you so much for taking the time to drop by and looking at my Website, I really appreciate it. It has taken me a long time to get where I am today and I have loved every minute of it. I spend months creating unique and exclusive magic, and I can’t wait to share them all with you. Please take some time to read some of the testimonials listed below, and then, get in touch for a chat, I really look forward to hearing from you and seeing how I create a very special night for you. 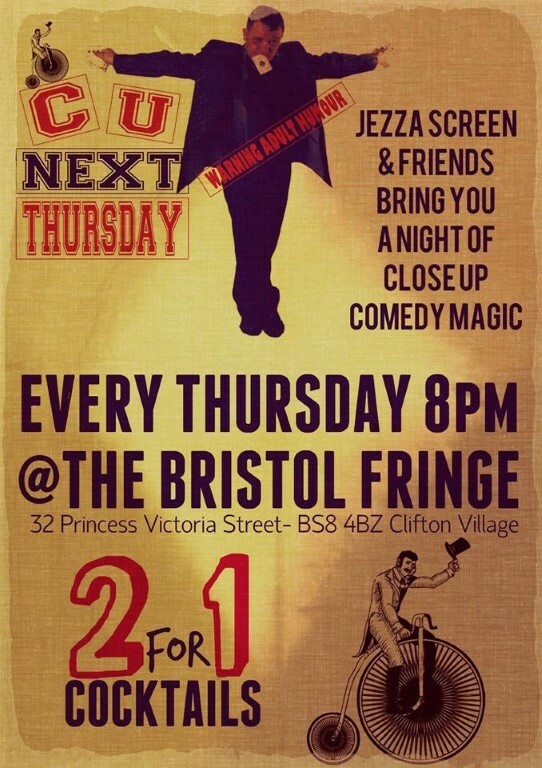 Jezza is creator and host of C U Next Thursday Magic only at the Bristol Fringe Bar in Clifton village. Please like, share and come along!